In this post we continue our look at form, matter, and intent in sacraments. Previously, we explored the who, what, when, where, and how of the sacraments of initiation. As a refresher, intention, form, and matter, are the absolute minimum required for a sacrament to be valid. First of all, sacraments require a minister who intends to confect the sacrament. In the previous column linked above, I used the example of someone sleepwalking while pouring water on someone and saying the formula for baptism, which would not make a valid baptism, as the person couldn’t have intended it to happen. Additionally required are “form” and “matter.” These would be the “how” and “what”. Form generally includes the words and actions while performing the sacrament. Matter refers to the materials present or prerequisites. Again, sacraments usually take place with many other prayers and rituals, but if those rituals do not include form, matter, and intent, they do not make a sacrament. Moving on then, from initiation to healing, let us look at the sacrament of reconciliation. The “who” part is easy here: Any Catholic, having reached the age of reason, can confess their sins, and they can only do so to a priest. “A priest alone is the minister of the sacrament of penance” (Code of Canon Law, 965). “God, the Father of mercies, through the death and resurrection of his Son, has reconciled the world to himself and sent the Holy Spirit among us for the forgiveness of sins. Through the ministry of the Church, may God give you pardon and peace, and I absolve you from your sins in the name of the Father, and of the Son, and of the Holy Spirit.” All the other words said by the priest, or the “bless me father of the penitent, are worthwhile, but not necessary. But that formula of absolution “expresses the essential elements of the sacrament” (Catechism of the Catholic Church, 1449). “To receive the salvific remedy of the sacrament of penance, a member of the Christian faithful must be disposed in such a way that, rejecting sins committed and having a purpose of amendment, the person is turned back to God. A member of the Christian faithful is obliged to confess in kind and number all grave sins committed after baptism and not yet remitted directly through the keys of the Church nor acknowledged in individual confession, of which the person has knowledge after diligent examination of conscience” (Canon 987-988). “after having attained the age of discretion, each of the faithful is bound by an obligation faithfully to confess serious sins at least once a year” (CCC 1457). “The proper place to hear sacramental confessions is a church or oratory” (Canon 964). 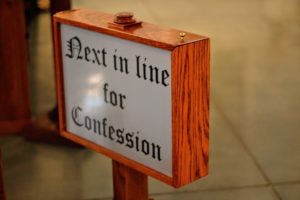 Additionally, that canon goes on to say that when confessionals/confession rooms are built in a church, they should have a fixed grate available, so the option is there to confess anonymously should the penitent wish. 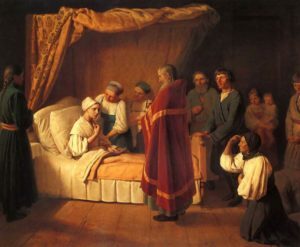 “By the sacred anointing of the sick and the prayer of the priests the whole Church commends those who are ill to the suffering and glorified Lord, that he may raise them up and save them. And indeed she exhorts them to contribute to the good of the People of God by freely uniting themselves to the Passion and death of Christ” (CCC 1499). “Every priest and a priest alone validly administers the anointing of the sick” (Canon 1003). The matter of the sacrament consists of the anointing with Holy Oil and the laying on of hands by the priest. There is no prescribed location for this sacrament, as people can be sick anywhere, and often, when they are, are unable to come to a specified location. When can a priest administer this sacrament? Any time someone has a sickness which could lead to death, or is of age where death could be imminent. It need not be performed only when in danger of immediate death. If someone is aware of a condition or procedure which could lead to this danger, they can call upon a priest (CCC 1514). Moving now to the sacraments which “are directed towards the salvation of others” (CCC 1534), we begin with the Sacrament of Holy Orders, “the sacrament through which the mission entrusted by Christ to his apostles continues to be exercised in the Church until the end of time” (CCC 1536). Through the sacrament of Holy Orders, men become deacons, priests, and bishops. That statement gives part of the “who” answer to this question. The Church has no authority to ordain women as priests (Ordinatio Sacerdotalis, 4), and Canon Law currently says the same about deacons (Canon 1024). Another issue pertaining to who may be ordained involves the hierarchy of orders. In order to be ordained a priest, one must be a deacon. In order to become a bishop, one must have already been ordained a priest. As to the minister of the sacrament, this is limited to a bishop (Canon 1012). The consecration to a bishop differs from the ordination to the priesthood and diaconate in several ways. First, while a bishop is responsible for those whom he ordains to the priesthood, in order to consecrate someone as a bishop, they require the permission of the pope to do so, and secondly, there should normally be at least three bishops present who consecrate a new bishop (Canon 1013-1014). Ordinations take place in a Mass, preferably at the cathedral, and when possible on a Sunday or Holy Day of Obligation (Canon 1010-1011). The matter of Holy Orders consists of the laying on of hands (CCC 1538), which coincides with the form: the respective prayer for each level of orders, said by the bishop when ordaining a man (CCC 1573). Holy orders is the means by which we consecrate men to lead the laity in their parish or diocese to salvation. Matrimony does the same thing, on a smaller scale. As the family is the domestic church (Lumen Gentium, 11) the spouses’ primary task is to bring each other and their children to salvation (CCC 1601). Many people are surprised to hear who the minister of the sacrament is, at least in the Roman Catholic Rite. 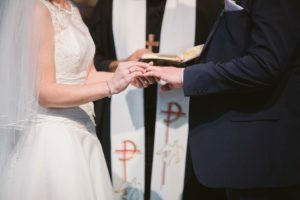 While a priest or deacon must be present to receive the public declaration of consent on behalf of the Church (Canon 1108), the spouses themselves actually confer the sacrament upon each other. Eastern Rite Catholic marriage liturgies also have a priest or bishop at the sacrament, which is called “Crowning.” (CCC 1623). After the couple give their consent, the minister actually places a crown on the bride and bridegroom. 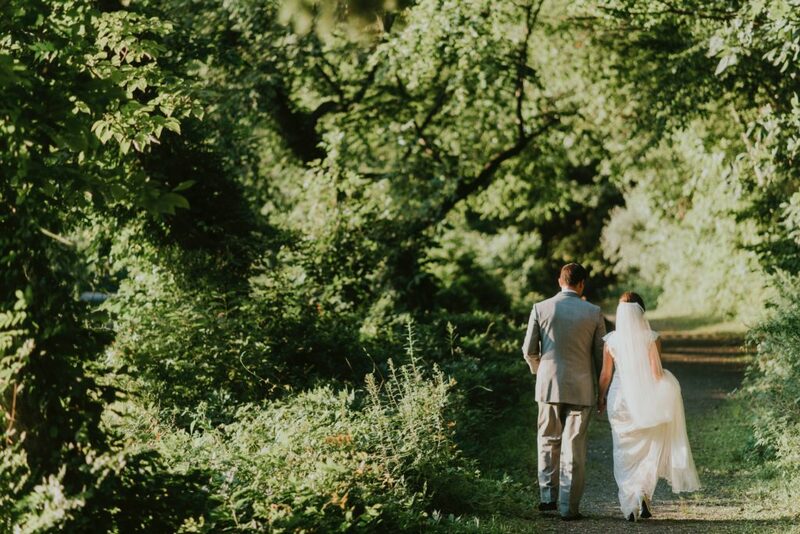 The location of the wedding should be in a parish church, generally at the parish of one of the couple, however with permission of their pastor it may be performed at another church (Canon 1118). This is because the couple are beginning their new family, their own domestic church, so it is fitting that this is celebrated along with the parish family they currently belong to. While the canon states this is the norm, it does give local bishops permission to allow the sacrament in “another suitable place,” but this is rare. Currently, for example, only two dioceses in the United States have given such broad permission. No provisions are made as to the time a wedding must take place, aside from frequency: it may only be received once, as long as both spouses are living. The form of matrimony, as implied above when discussing the ministers, is the consent of the marriage (Canon 1057). When the spouses give this consent publicly in front of the church, the marriage is presumed valid. The matter consists of this consent, along with the desire to live together in unity, as well as the consummation of the marriage (Canons 1056, 1061). The sacraments of the Catholic Church are vital signs of the grace given to us by Christ. They also “touch all the stages and all the important moments of Christian life (CCC 1210). In this, we see how their variety coincides with the way in which it touches these stages. Just as a child’s needs are different from those of a young adult or a person at the end of their life, our sacramental needs change, and so does the manner in which Christ pours out his grace on us. Therefore, it is no surprise that the essential elements, such as form and matter, and the means by which we receive the graces vary as well. Truly, we are blessed that our Lord and our Church have given us these sacraments which meet us where we are at all stages of our journey to heaven. Matthew joined Ascension Press in 2014. He studied political science, business technology, and business management at Delaware County Community College and Temple University. Writing is not his only creative outlet: when not in the office, he can be found on stage as a member of Stealth Tightrope, a local improvisational comedy troupe, or as a musician. A clarinetist with the Merion Concert Band, Matthew also enjoys playing professionally alongside his wife, Susan, who is a professional pianist, vocalist, and composer.